These fine bronze figures have been cast from bronze and patinated. They depict Jean-Jacques Rousseau (Swiss, 1712-1778) and Francois-Marie Arouet, who was better-known as Voltaire (French, 1694-1778). Rousseau and Voltaire were important philosophers and writers, and key figures of the Enlightenment in France. The figures are cast after models made by the famous sculptor, Jean-Claude-Francois Joseph Rosset (French, 1706-1786). Rosset created several sculptures of Voltaire and Rousseau, in different media and on a variety of scales. Today, these works form part of major art collections, such as the Metropolitan Museum of Art in New York. Both Rousseau and Voltaire are dressed in buckled shoes, stockings and breeches, with frilled shirts, waistcoats and frock coats. Each figure wears a wavy wig, Rousseau’s is short, and Voltaire’s shoulder-length, and has his hat tucked under his left arm. Rousseau clasps a cane in his left hand, and a furled scroll in his right, while Voltaire’s left hand is placed in his pocket, and his right delicately holds a cane. The bronzes are placed on rectangular stepped yellow Siena marble plinths, which are encircled by patinated bronze bands, decorated with laurel leaves. Superb quality pair of bronze of Voltaire and Rousseau On original reuge marble and bronze bases. Measure: each stand at 9" tall France, circa 1850. Set of patinated cast bronze sculptures on travertine bases. #1 Measures: 18.75" wide x 38.5" tall x 8" deep #2 Measures: 17.5" wide x 34.5" tall x 8" deep. This whimsical sculpture of a stag is from the famed Werkstatte Hagenauer Wien. 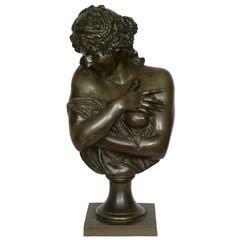 Fine and monumental patinated figure bronze title "Woman Fauno" Italy, 19th century, anonym artist, raised on a rouge de France marbre stand. Two bronze sculptures of alligators, each one realistically cast with sharp teeth, great for indoor or outdoor use, one has a darker patina, sold individually.